Looking for movie tickets? 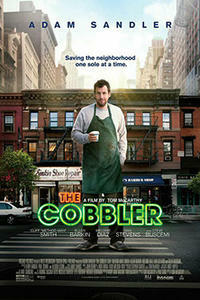 Enter your location to see which movie theaters are playing The Cobbler near you. Max Simkin (Sandler) repairs shoes in the same New York shop that has been in his family for generations. Disenchanted with the grind of daily life, Max stumbles upon a magical heirloom that allows him to step into the lives of his customers. Interesting idea about empathy turns into disturbing fable.